This bag is very sturdy and conveys you are a professional! Advertise your booth or store by applying a company label to the front of the bag. COMMENTS: love these bags for my products. I like the frosted look. COMMENTS: I love that when someone buys from me everyone else at the craft show can see through the bag and ask them where they got them. "Natural Frost Handled Bag (9" x 12")"
COMMENTS: Great sized bags. Quite sturdy. Used at craft shows. "So happy I found these!" COMMENTS: I was in need of more shopping bags and I stumbled onto these frosted handle bags. They are perfect!! I even hand stamped my logo onto them with an ink for plastic...makes them look extra fancy. COMMENTS: I love these bags for when my customers make a purchase. I label them and send them on their way. • I would like the bottom to be flat. COMMENTS: These lovely sized bags took my business to the "I'm serious level!" I ordered snazzy labels that match my business cards to stick to these bags, added some natural color tissue paper I got on A----n and oh how smart they look. I love the "See thru" aspect as my customers are advertising as passersby get eye contact of what's in side the bag at craft fairs. (humans are innately nosy!! lol) It's great that they are large enough to put more than one bar of soap in. I will be getting more. "Natural Frost Handled Bag 9'x12""
COMMENTS: I love using these bags to pack items for customers. These bags give my business a professional look and show off the products! They are also very roomy for my customers who make larger purchases. COMMENTS: These bags are a great size. They seem to be strong and can hold a lot of products. The handle made them easy to carry. These will be my go to bags. COMMENTS: These bags are perfect for smaller orders of soap and products at the vendor fair. It easily fits four 1 1/4 inch bars along the bottom of the bag and there's room for extra without crushing other items. I will be ordering these and the larger size for my upcoming craft fair. COMMENTS: The bags are look good and they are very strong. COMMENTS: This is currently my go to bag. It is a great size for holding 3-4 products and it holds up. I have never experienced a tear or break like I have with paper bags in the past. "These were perfect for my labels to stick on !" COMMENTS: I've been using these bags for a while, they are durable and give your business a professional look. Highly recommend! COMMENTS: The bags are sturdy and professional looking. COMMENTS: I really like these bags. people like to have their product in a bag and this really does the trick. I added a sticker with the name and logo of my company and it added a much more professional look. Will definitively buy again!! COMMENTS: Excellent bags-sturdy and just frosted enough to see what's there, but leave a little mystery. I applied my personal logo/label on the bag, and the whole look was very professional. Will buy more. "Great bag and perfect size for customers "
COMMENTS: I purchased these and will be buying slot more. They are very well made, and the opening for the handle is awesome. Plus I was able to add my company logo and information by just adding my label right on the gag. It holds a great amount of products and others can see as customers walk around my company name and the look of the products in the bag FREE ADVERTISING! COMMENTS: Awesome little bags! Hold's quite a bit of weight! COMMENTS: when I use these to put orders with multiple items, they wrinkle VERY easily, making the bag look old and "used". I DO like the size and the handle design though, as well as the frosted look. However, I probably won't be ordering these again after I run out. COMMENTS: This bags are the perfect size I just put my logo label on it and as customers walk around events its easy promo. COMMENTS: Professional shopper for sales to my customers, which I love! 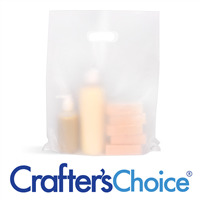 COMMENTS: These are lovely bags perfect for my soap and small candles. I label them with simple avery labels with my info. These are classy frosted bags, a far cry from my paper bags. Next order I will be getting the larger 12x15" size as well. COMMENTS: I use mostly paper lunch bags at my shows, but I use these plastic bags for heavy items, larger purchases or when I want to make a nice presentation. They are thick, durable and attactive. COMMENTS: These are perfect bags to showcase work at fairs. When people see the semi clear bags with the colorful soap that come over to see what products we have! COMMENTS: Very strong, quality material. Customers love these, very profession looking. Will purchase again! COMMENTS: I love these! They are the perfect size to use at shows. I printed a sticker with my logo and put on them and they look so professional! Will be ordering more soon! COMMENTS: I bought theses to use when selling products and they work great when applying your labels, just wish they were bigger. COMMENTS: I really like these bags. They are sturdy & professional looking. You do have to be careful not to crinkle up the bag. I was able to fit 2 6oz. toggle bottles, 24 oz. lotion bottle and a 1 oz. Boston bottle in it. The handle did not pull or tear. I made a label w/my co.'s name on it & placed on ea. bag. It really looks nice! I can't wait to use at the Farmers Market or my next Girl's Night Out show. I definitely will be purchasing more. COMMENTS: These bags are super cute. I print my own logo on labels/sticker and stick to the bag. They look nice and professional. "A must if you see retail!" COMMENTS: These bags are sturdy and can hold a lot of products without tearing. COMMENTS: These bags were awesome for my customers. I added a label with my business name and very sturdy to carry my customers purchases. COMMENTS: These are perfect to have at my table at the craft market; they are sturdy and come in 2 sizes. I place purchased items in them for my customers who don't have a shopping bag with them as my craft market runs in conjunction with the local farmers' market. With my label on the front, it provides advertising as well. COMMENTS: I love these! They look so pretty with my soap in them. I use them for my craft shows and they are very durable and they go very well with our products! COMMENTS: these rock and hold a lot! "Used to package my soap"
COMMENTS: Used this at several craft shows works great. Holds a lot and don't rip or fall apart. COMMENTS: These bags came in handy when I run out of my normal packaging wrap. Just fill, fold and place sticker label. COMMENTS: These bags are sturdy, professional looking and just what I needed. Love them. They also travel easy as they don't take up a lot of room. COMMENTS: I love these bags! They look great and are nice and sturdy! COMMENTS: Very sturdy and capable of holding several items. I like the frosted look of the bag and I made stickers with my business logo to place on the bag. They give a professional look to my business and attract more customers. COMMENTS: I like the look of these bags as they allow you to see inside. They are very handy and professional looking until they start to crinkle. Maybe I am a bit hard on them as I find myself being overly careful when placing my products inside as they tend to crinkle and appear a bit messy if not. "Nice weight, size, and look"
COMMENTS: These bags are perfect for craft shows. They are just the right size for my soaps and crocheted items, and adding a business sticker to the bag makes for a very professional look. Will buy again. COMMENTS: Perfect for my small products at Craft show and other events. Love the frosted look. Classier than the "thank you" bags. COMMENTS: I love the size and it is a great quality. I put labels on mine as well. It looks professional and I am confident that the products are easy to handle for clients at craft shows where they may be walking around for a while and the handles are easy to hold. COMMENTS: I'm so happy with these bags. They are quite professional looking and can hold a good bit of product. These are always good to have on hand at craft shows and such. COMMENTS: This is a sturdy, professional looking bag. I have been very pleased with it. I also buy the next size up for larger orders. COMMENTS: This is beyond perfect. Great in between size and looks so professional I don't have to spend extra time and money in designing a bag of my own. Frosted so my products can show through (bonus!) and very sturdy for heavier scrubs. Love these! "Great extra for fairs and markets." COMMENTS: These bags add a nice touch when selling to customers. COMMENTS: These are the perfect size for my customers! I can bag up their body scrubs, bath salts, and even a bottle of lotion or soap! :) So much better than the paper bags I was using! COMMENTS: These are a great addition to my shipping supplies. They look great and fit a good amount of products in them. They also give a sleek look. "So in love with these bags"
COMMENTS: I purchased these bags for a farmers market I participated in. They are very strong and pretty elegant. Since they are simple, there is room to add a sticker or some other decoration to make it your own. However, I have to say, they are nice as is. I would highly recommend these bags. "a very classy looking bag"
COMMENTS: we love these bags because they are very nice looking and strong enough to handle WHATEVER we put in them! You never have to worry about the bottom coming out as your customer walks away. we have loaded these bags up with soaps and lotions and never once had a problem. COMMENTS: I use these for small orders. If a customer purchases an item or two these are perfect. Also they are recyclable. Awesome! COMMENTS: These bags are very strong and I couldn't tell from the picture but they have handles cut into them. COMMENTS: Nice size for just a few items while selling at craft shows and such. I've had a lot of compliments on these cute little bags. COMMENTS: These are awesome for my craft events. The bags don't hold many big things, but they're great for soaps. COMMENTS: These bags are economically priced and very sturdy. They give my business a professional look. Will order again. "Are these made of type 2 HDPE? I need my bags to be made from recycled material." Staff Answer Yes, these are made from HDPE - Recyclable #2 material. "Would an ink hold to these? I have a stamp with my logo that I'd like to use. Thanks!" Staff Answer These bags are coated with a waxy substance and we do not feel a stamp would work. You could certainly use a label or sticker on the bags. "What is the best way to apply a company logo or label to these bags? " I would say apply a sticker with the company name on it . The frosted bags have a slight texture to them, so a sticker/label with a permanent adhesive would be the best way to go. I've used a label and I've actually ran them through my printer. Both methods worked well for me. Take a sample to your printer so they can suggest a good sticker stock. Clear is a nice option if you want a printed-on look. "Do these have a gusseted or flat bottom?" No, the bottom is not flat. It's more like an envelope is shape on the bottom. "What are the Natural Frost Handled Bags made out of"
Staff Answer These are made of high density polyethylene.